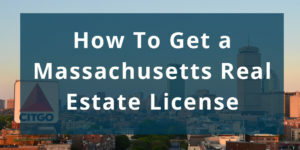 This article explains exactly what you need to know to get a Massachusetts Real Estate License. 1. Are you at least 18 years old? 2. Do you have a valid SSN? 3. Are there 3 people (non-relatives) who can vouch for your character? 1. In a physical classroom for all 40 hours – typically divided across 4 days (10 hours per day). 2. Online courses can be taught live online, so you can complete the class from the comfort of your couch. Upon completing the 40-hour class, the school will distribute a “Candidate Handbook” which will include your certificate of completion and instructions to schedule your Massachusetts real estate license exam. The Massachusetts real estate license exam MUST be taken within two years of completing the pre-licensure class otherwise you will have to complete course again. You must score at least 70% to pass the exam. You will find out immediately after completing the exam (at the testing center) whether you passed or failed. When you pass, you will be issued your Massachusetts real estate agent license right there on the spot. Keep Me Certified is a Massachusetts approved real estate school that offers the 40-hour pre-licensure course at least once a month. Click here to view their schedule of upcoming courses. Once you are a Massachusetts licensed real estate professional, you need to complete 12 hours of approved continuing education credits. You can complete 12 hours of approved continuing education through a licensed real estate school at any time during the 24 month period immediately preceding the expiration date printed on your license. 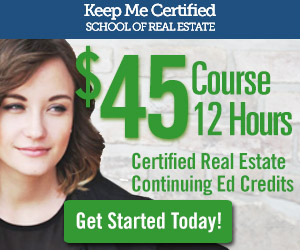 To learn more about our Massachusetts real estate school and online video based classes, visit us at keepmecertified.com. Keep Me Certified is a Massachusetts based real estate school building better training for real estate professionals. Launched in 2012, Keep Me Certified has since trained more than 20,000 licensed real estate professionals through our video based online continuing ed and pre-licensure class. To learn more, visit us at keepmecertified.com.